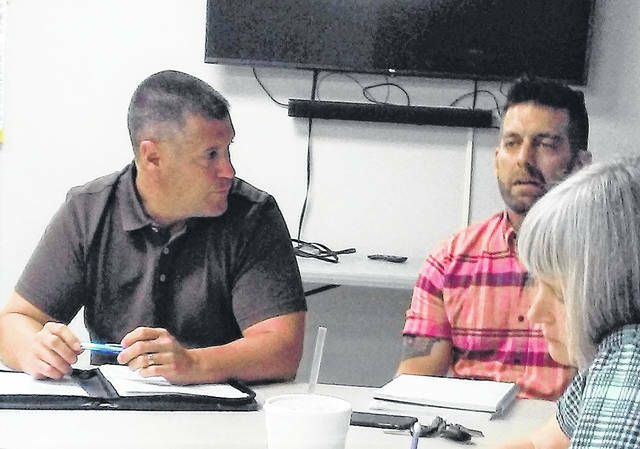 Hillsboro City Councilman Brandon Leeth, left, sits in a Finance Committee meeting on Monday with finance Chairman Justin Harsha, right, and Councilwoman Wendy Culbreath, right foreground. Hillsboro City Council’s Finance Committee on Monday continued deliberation on whether or not the City of Hillsboro should join the Paint Creek Joint EMS/Fire District or continue utilizing its services on a contract basis, but the hour-long meeting ended without any endorsement on either side of the issue. The meeting, held at the North East Street fire station, was free on opinions and at times contentious, with much of the discussion centering around a property tax increase that would come with joining the district. Finance Committee Chairman Justin Harsha expressed concern about the 5.5-mill property tax, which would be automatically imposed if the city joins the district. It has been said the increase amounts to about $170 per year for each $100,000 of property valuation. Councilman Brandon Leeth said contracting is a better business decision, and he, too, is concerned about the tax increase. That tax increase bothers local businessman Greg Grant, who voiced his opinions at the meeting. Grant said the city should reduce the current earnings tax by half a million dollars, and at the same time place a levy on the ballot so the citizens have their choice. Currently, earnings tax funds go to the general fund from which fire and emergency funding is drawn, according to Councilwoman Ann Morris, who also sits on the Finance Committee. Morris said she is in favor of joining the district but added that she feels putting the levy on the ballot is not necessary. Morris said joining the fire district would result in what she called a minimal increase in taxes for those that own property in the city, adding that by her calculations the average increase to each property owner would be about $7 a month. Morris said the increase would bring greater accountability to landlords, since some live outside the city. Morris added that joining the district would not mean any increase in earnings taxes. Morris also expressed concern about the possibility of fluctuating costs that come with continually renegotiating contracts. Morris said the city would be able to do more street maintenance because it won’t be spending money on fire and emergency services. Some attendees raised concerns about the city not having a voice within the district if the city continues contracting, but Harsha, who serves as council’s liaison to Paint Creek and often attends district board meetings, said he isn’t worried. Safety and Service Director Mel McKenzie brought up the advantages of entering into an agreement as opposed to subcontracting. Grant said Morris’ $7 per month pitch was similar to what one would find when buying a car. The tax increase bothers councilwoman and finance member Mary Stanforth as well, who is still on the fence as to whether the city should join or not. Grant said from a private citizen’s standpoint, the devil is in the details.